There are times when a diesel just won't do; the fuel's relatively low pricing compared to petrol and its inherent better efficiency, notwithstanding. It could be a mental block about diesels not being as quiet or refined, or it could simple be a case of very little driving. Whatever the case, if petrol is your preferred flavour, the Mercedes E 200 CGI is certainly worth considering. This is the petrol-powered new E-Class. It looks identical to the diesel version we tested a few months ago. So, it too looks young and dynamic, and those LED daytime running lights truly give it an identity of its own. We really like the way this facelift looks but wish Mercedes had worked equally hard at getting the rear-end styling up to speed. 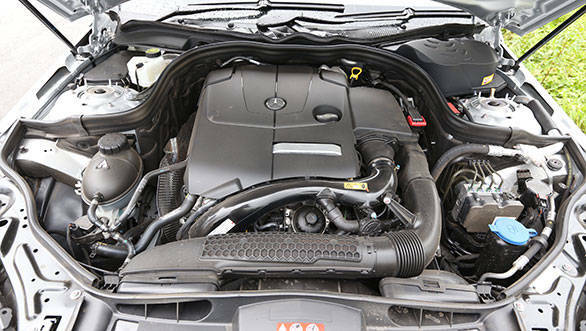 Inside, the E 220 CGI looks identical to the diesel version. 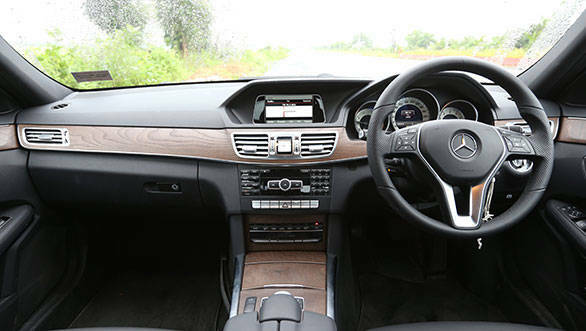 However, unlike the diesel E 250 CDI, which sported piping on the seat and metal outlines on the dashboard, the E 200 CGI gets matte wood finish. The wood doesn't look as dynamic as the metal, and in fact, makes the cabin look a tad dull. But, the texture, the grain, and the feel of the wood truly is top class; it feels rich and warm. Equipment wise, the petrol is identical to the diesel, but not the same as the launch edition we tested. The latter, for instance, had a panoramic sunroof, parking assist and different sized front and rear tyres. None of this is now available on the E-Class. 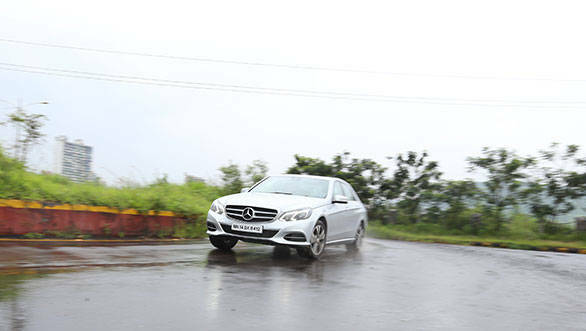 What the E 200 gets, though, is the upgraded COMAND system, a multi-zone climate control system, parking sensors, a regular sunroof, and electrically adjustable everything. From the front seats to the steering wheel to the ORVMs, everything is electrically powered. It also comes with eight airbags and ESP on the safety end, along with Mercedes' Pre-Safe. Now to the engine. This 1991cc, four-cylinder, direct injection, turbocharged petrol makes 184PS and 300Nm of peak torque. The torque figure, which is already fantastic for a petrol engine of this size, peaks at barely 1200rpm and then stays flat - and by flat we mean plateau flat - till 4,000rpm. This not only gives the E 200 a fantastic mid-range, it helps it achieve good fuel economy figures too. The car returned 8.1kmpl in the city with the highway figure climbing to 15.3kmpl. 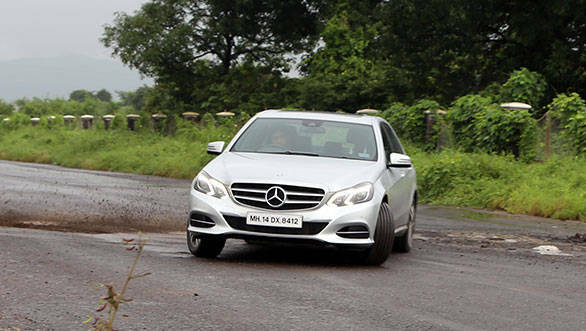 On the performance end, the E 200 dispatched the 0-100kmph run in 8.3s and the quarter mile in 16.2s. If pressed on, it can hit a top speed of 233kmph. It's a quiet and refined engine, this. It doesn't rev very quickly, but never in the rpm range does it feel strained or gruff either. It also gathers speed with calm but rarely does it feel slow. The engine is coupled to a 7-speed torque convertor automatic, which might not be the quickest or the most responsive to manual shifts (it gets steering mounted paddle shifters for manual override), but it is seamless in its shifts, particularly when driven with a light foot. 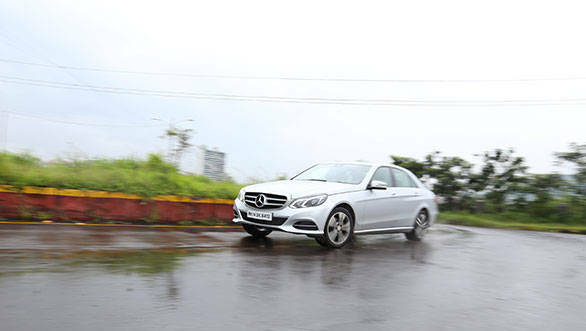 The E 200 has the legs on the highway, but it's equally at home living in the city. The E's light and quick steering makes easy work of parking and dodging traffic, and the clear visibility over the hood ensures you don't get too nervous making your way past people or motorcyclists. We like the ride on the E as well. It's a bit noisy at slower speeds, but the suspension works much better as speeds increase. It's not magic carpet like, but it is easy to live with. As is the E 200 CGI as a whole.